Life Before the Dinosaurs: Haikouichthys. Haikouichthys was the first fish. It lived in the Cambrian Period. It wasn't good at swimming, though, because it didn't have a single fin. It just had to slither around in mid-water like a snake and try to move. But it was probably a very slow swimmer. The name is pronounced high-coo-ICK-theez. As you would probably guess, Haikouichthys was a jawless fish, so it probably ate extremely tiny things. Haikouichthys was 1 cm long, about as big as your thumbnail. 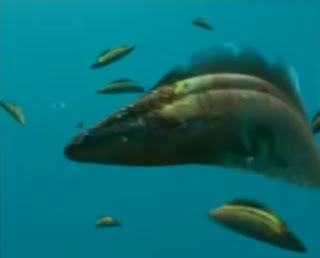 This semicircle-shaped fish probably went extinct because of being overeaten, because there were so many monster predators around that Haikouichthys probably was the perfect prey.